* This is my article in BusinessWorld on April 21, 2017. Biodiversity of living things is more common in the tropics compared to those in the northern and southern hemisphere. Geological diversity of nonliving things is more common in the Pacific countries as there are more volcanic and earthquake movements in the “Pacific Rim of Fire” than the rest of the planet. That is why for almost all commodities -- copper, gold, molybdenum, silver, nickel, bauxite, zinc, lead, etc. -- countries in the Asia-Pacific Economic Cooperation (APEC) are the dominant suppliers and exporters. Volcanic gases and molten rocks are the main producers of mineral products below the ground. 1. Mineral rent is the difference between the value of production for a stock of minerals at world prices and their total costs of production. 2. Mining Contribution Index (MCI) is calculated based on aspects of mining and metals contribution to national economies, composite for three variables: (a) Mineral export contribution in 2010 as percent of total merchandise exports, (b) Increase/decrease in mineral export contribution 2005 to 2010, and; (c) Mineral production value as a percentage of GDP in 2010. 1. Countries on the “ring side” of the Pacific Rim generally have higher MCI -- Australia, Chile, Papua New Guinea, Peru -- than those a bit far from the Rim. 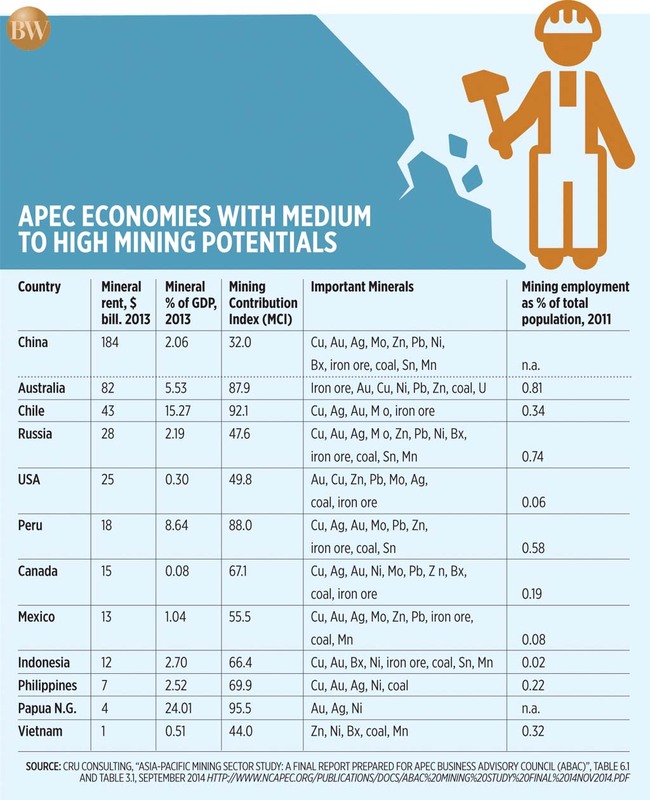 Thus, while China has the biggest mining rent in 2013, it has low MCI. 2. The Philippines’ low mining rent and output is mainly a result of the policy and taxation environment that is generally not attractive to more big corporate mining but the country has high MCI. It is the world’s 2nd biggest producer of nickel, next only to Indonesia. 3. Employment in mining is generally low relative to total population because the industry is very capital intensive. Workers hardly use spades and other manual tools; they use huge trucks, loaders, bulldozers, and other machines. Thus, the Philippines’ 0.22% that is being looked down by many anti-mining groups as being “not job-creating enough” is actually higher than those in Indonesia, Canada, Mexico and USA. The Philippines is one of the most mineral-rich countries in the planet, the archipelago being largely a product of volcanic movement rising from below the sea millions or billions of years ago. Thus, mining potential is very high even utilizing only a small portion -- less than 1% -- of the country’s total land area. Recently, DENR Secretary Gina Lopez has launched a series of lectures and public fora advocating “more investments in biodiversity than in mining.” This is after she ordered the closure of 22 mines and suspended five others, and ordered a P2-million bond by mining companies per hectare of “disturbed” agricultural lands before they can haul their mineral stockpiles. The Secretary has not produced any realistic numbers of biodiversity investments while the Chamber of Mines of the Philippines (CoMP) has projected at least $30 billion of big mining investments in the next 10 years if the policy environment has improved and stabilized. In my agro-forestry farming experience in a farm in Bugallon, Pangasinan since two and a half decades ago, I saw how mahogany trees we planted would grow well in a relatively rich soil but would have stunted growth, many even die, just about 50-100 meters away in land with high silica deposit and potentials. This further shows that mineral-rich lands and mountains are generally less conducive for agriculture and even for forestry because the soil has very low nitrogen and phosphorous levels. The government should optimize the high mining potential of the Philippines -- to create more jobs, generate more exports and economic output, give more community projects that mining companies are mandated to provide. Big government presence in mining is justified only in laying down rules that apply to all, big and small-scale miners. Big mining companies in particular are expected to strictly follow existing rules especially those provided by the Mining Act of 1995. Beyond that, there should be less government interventions and taxation, there should be less political harassment and business uncertainty, especially with many mining closures and suspensions.